On April 11, 2019, Editorial Team at the International Electrotechnical Commission has published a blog post: “New IEC Technical Report helps stakeholders evaluate human exposure to 5G base stations”. This report is to provide assurances of quality and safety of the 5G technology. “The IEC TR will provide a vital resource for network operators deploying 5G, as it illustrates test methods and worked examples on 5G trial sites. It will benefit many stakeholders, including facility managers, building owners and governments and local communities by helping them to ensure that they are testing their own networks and base stations correctly. In both quoted fragments of text from the IEC blog post, there is emphasis on assuring safety. 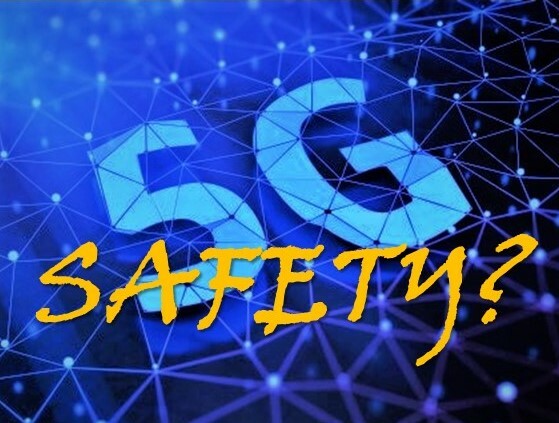 IEC, providing this technical report wants to assure both, providers of the 5G technology and users of the 5G technology that when properly tested the equipment is safe to operate and use. However, there is problem with this assurance of safety. The assurance of safety is based on assumption and not on scientific data. It is assumed that low power radiation will not cause health effects… but there is not enough of bio-medical data to support this assumption. Namely, the research on 5G millimeter-waves is vast but it mostly covers technology and radiation dosimetry as can be found using the PubMed database. There is only very limited research on biological effects of 5G-millmeter-waves. Just some 200+ of peer reviewed biological studies (EMF Portal database). These are mostly in vitro laboratory studies. No any available epidemiology study or animal toxicology study! Organizations like IEC and ICNIRP rely on assumption that the low power radiation emitted by the 5G cell towers and cell phones is enough assurance of no health effects. This assumption is propagated by engineers but it cannot be undersigned by biologists or medical professionals. Of course, this assumption might be correct or this assumption might be incorrect. Currently, however, nobody knows what is correct, because no adequate bio-medical research has been performed. It is déjà vu all over again. In 80’s it was assumed that low power cell phone radiation will not have health effects but in 2011 IARC classified this radiation as possible human carcinogen (2B). The same is happening now with the 5G. 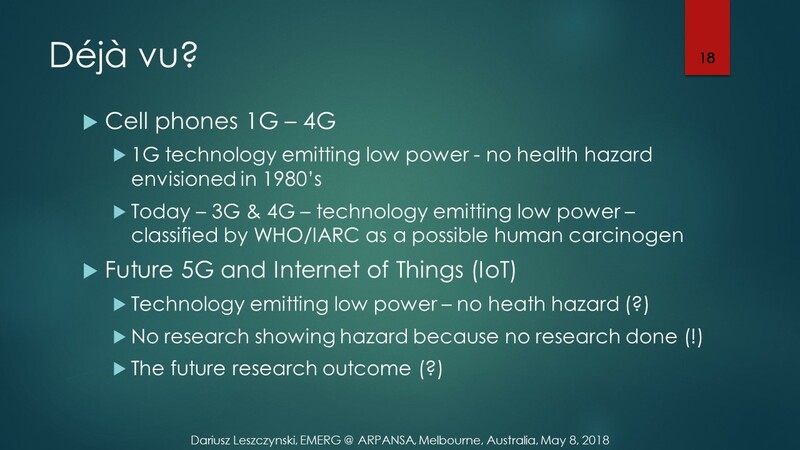 The 5G is being deployed and health safety is not based on sufficient bio-medical research but it is, yet again, based on an assumption that low power emissions are safe. What the subsequent, post-deployment, research on 5G radiation will show… nobody knows… time will show. Hopefully it will not be another déjà vu. This entry was posted in Mobile phones and health, Radiation and Health and tagged 2B, assumption, déjà vu, IARC, IEC, Mike Wood, possible carcinogen by dariuszleszczynski. Bookmark the permalink. Ah, but the trick is, “adverse health effects” and “harmful health effects” are in the eye of the beholder. Many of us peons would disagree. Same goes for those headaches too.